When I am asked whether a perfect civil society has ever existed, the answer often surprises people. A study by Charles H Fairbanks showed that it existed in Kosovo in the middle years of this decade. At that time, ordinary people in this small country in southern Yugoslavia fulfilled the anarchist’s dream of collective responsibility, self-help, creativity and self-control. Ethnic Albanians, who formed 90 per cent of the population, set up their own institutions, paid taxes to an informal government, and ran schools in people’s homes and in mosques, while Albanian doctors delivered primary health care. There was also a high incidence of neighbourliness and volunteering within the Albanian community. The blood feuds between Albanians that had led to charges of ‘amoral familism’ in the 1980s were put to one side to create Rousseau’s imagined ‘Sparta without an army or a state’ – a citizenry who could regulate themselves without need for external authority or military power. Money to support this experiment was raised from sympathetic countries, particularly Germany, the Albanian diaspora, and smuggling. Nevertheless, there was a shadow cast over this apparently idyllic civil society. Serbia had stripped Kosovo of its autonomy in 1989, and Serbs replaced Albanians in government jobs. Following a brief rebellion, which was put down with 140 deaths, Albanians informally seceded from the state and set up their own parallel institutions. When Ibrahim Rugova was elected president of the Albanians in May 1992, his Democratic League of Kosovo used the device of parallel institutions as a form of passive resistance against the Serbs. Such passive resistance was undertaken as a conscious alternative to the Muslim and Croatian stance in Bosnia, where aggressive confrontation with the Serbs had led to widespread ethnic cleansing. Not all Albanians liked this approach. Some suggested that pacifism meant passivity but they went along with it for the sake of unity. Serbs accepted the situation, save for some token gestures, and supported Rugova, fearing a replacement would be more hostile. A turning point came in 1995, with the end of the war in Bosnia. Albanians in Kosovo had expected a settlement of the Kosovan question in the Dayton Peace Accord, and were shocked when there was none. Feeling that the West would not support Kosovan independence, the consensus on passive resistance was shattered, and Albanians became more militant. The result was the emergence from 1996 of the Kosovo Liberation Army (KLA) as a paramilitary force committed to winning independence through violent means. The years 1997 and 1998 saw an ever-growing number of terrorist incidents, with atrocities on both sides, leading to a Serbian clampdown. The rest we know and the tragic results are now constantly before us on our television screens. As in Kosovo, civil societies tend to thrive in an ‘adversary culture’. When people feel at odds with the status quo or dislike the powers that be, they will commonly organize a space where they can express themselves and plan for change. In Mexico, for example, the Alianza Civica (Civic Alliance) enlists broad citizen participation in favour of a new political landscape. This national voluntary civil society organization presses for transparent government in a county where one political party has held on to power for 70 years through a combination of populism, corruption, coercion and electoral fraud. In India subsistence farmers, traditional fisherfolk, tribal peoples (Adivasis), sweatshop workers, ‘untouchables’ (Dalits), women’s groups and ordinary villages are campaigning against what these ‘coalitions of the dispossessed’ call ‘recolonization’ by global corporations and international institutions such as the World Trade Organization, the International Monetary Fund and the World Bank. Such initiatives can achieve change. Alianza Civica, for example, has done much to make the Mexican government more democratic and accountable through monitoring the 1994 general election to ensure fair play. And in India the dissidence is proving a considerable bulwark against Western exploitation. Initiatives of this type are successful because they can mobilize large numbers of people. They become akin to a social movement that politicians and others with formal power ignore at their peril. In the ‘annus mirabilis’ 1989, dissidents appeared to be on a winning streak. The collapse of the Berlin Wall, the softening of Apartheid in South Africa and the liberalization of regimes in South America created a new world order. It seemed that liberal democracy would prevail everywhere; the marketplace based on consumer choice would reign supreme; and the absence of ideological dispute would put an end to war because there would be no basis for it. The idea of civil society emerged victorious from 1989. It functioned as a new secular ideology, becoming the building block for a good society which values people, regardless of age, gender, race, disability or other aspects of social background. Civil society would create a capacity for leadership within communities which, if harnessed and nurtured, would transform democracy and reshape the balance of power in favour of greater social inclusion, justice, dignity, equality of opportunity and respect. Civil society would complement the market, creating ‘social capital’ — the glue that binds people together in relationships – and adding a meaning to people’s lives over and above their role as economic producers or consumers. Civil society became a new paradigm for major development institutions, such as the World Bank and the European Union, as well as for some of the leading international charitable foundations. The paradigm may have changed in favour of civil society, but the methods have not. As Alan Fowler has pointed out, during the 1990s the aid system has developed a ‘mirror view’ of civil society, creating the institutions and organizations that produced democracy in the West with little thought to the entirely different context in Eastern Europe. In Warsaw Western technical advisers became known derisively as the Marriott Brigade, implying that they stayed at the most expensive hotels and were completely insulated from Polish life. 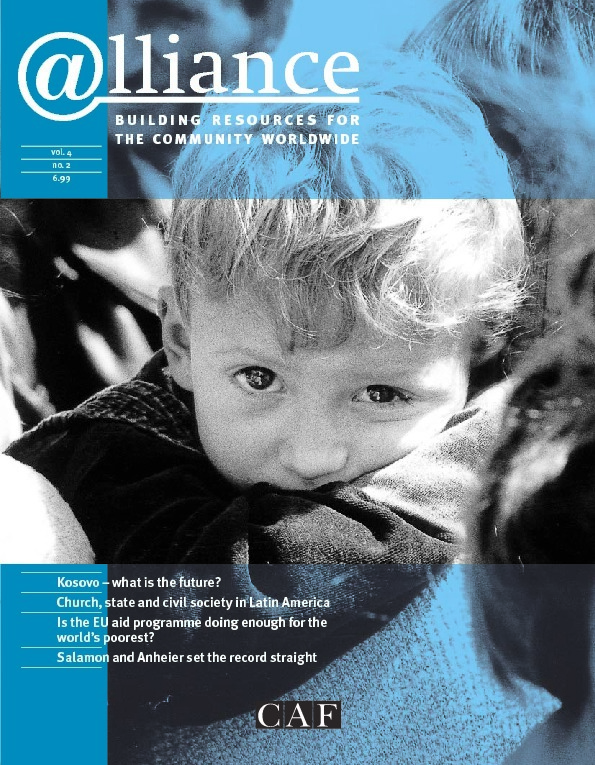 A study by the UK-based Charities Evaluation Services characterized the Western input into Central and Eastern Europe as the ‘adoption of the adapted’. None of this was really surprising, as much the same approach had been taken by the Western colonial powers in many developing countries. In doing all this, Westerners also exported their belief in infrastructure. Just as economic developers see the need for roads, railways, telegraph poles and wires, electricity and so on, civil society developers see the need for information, training and technical assistance, networking opportunities, appropriate legal systems, sensitive fiscal frameworks, finance, and so on. This is essentially a supply-side model of development. The philosophy of this approach is that civil society will develop provided the infrastructure is in place. But just as supply-side economics fails to trickle down to poor people, so supply-side civil society development fails to trickle down to communities and citizens. The main effect of Western intervention to date has been to build NGOs in capital cities, staffed by young professionals, which offer a variety of programmes including information, advice, training, technical assistance and networking opportunities. The number of people or organizations benefiting from these services is relatively small. A Webb Memorial Fellow who visited a provincial town in Romania was struck by the gap between the well-educated middle-class NGO activists and the mass of the population who had no connection with NGOs. Steven Sampson has shown that one of the main effects of a European programme to assist civil society development in Albania has been to import terms like infrastructure development (getting a computer), programme management unit (staff of an office), sustainability (lasting beyond the grant period). Sampson points out that any Albanian wishing to make a career in civil society development must learn two new languages: English and project-speak. Historical studies show that the key factor in the development of NGO sectors is people who pioneer social advance. Studies of such pioneers show that they tend to act out of righteous, religious or moral anger fired by direct perception of the need to solve a problem. Thomas Barnado, for example, the founder of children’s homes in the UK, began his life’s work when a child told him ‘I don’t live nowhere’. Muhammad Yunus, an economics professor at Chittagong University, tried to persuade banks in Bangladesh to lend to poor people who could offer no collateral. Ridiculed by them, he set up his own bank. It is not just well-educated people who can be developers. Robert Chambers argues that, by using the methods of participatory rural appraisal (PRA), people in many countries, in both urban and rural settings, have shown an astonishing ability to analyse their local, complex and diverse realities. Often, their views are at odds with the top-down realities imposed by professionals. A successful civil society development strategy depends on sharper targeting of local people as developers. The urgent priority for funders is to get money through to the grassroots. This would involve different kinds of strategies, such as setting up small grants schemes to support local efforts in coalition-building, campaigning, advocacy, and other work to address the root causes of inequality. The importance of this approach can be illustrated by an incident in international development that took place 50 years ago. Shortly after the Second World War, Peter Kuenstler (whose book New Community Organisation helped to invent community studies as an academic discipline) arrived at a village that had been more or less obliterated by shell-fire. Peter was working for an international development agency and had a lorry load of cement. Although not quite equivalent to the value of gold dust, cement was in short supply at that time and could command a high price. Peter had it within his power to offer the cement to the village. The village elders retired to consider how they would use the cement. Within a short space of time, they returned to tell Peter of their decision. What they needed, they said, was ‘a fountain’. ‘A fountain? What on earth do they need a fountain for?’ thought Peter, surveying the devastation all around him. However, Peter swallowed his doubt, remembering his personal philosophy that people know best what they need. So he signed off the cement and went on his way. Two years later he returned to the village. It had been completely rebuilt. The people had built the fountain together. Each evening, after the day’s work, they had congregated around the fountain to plan the next day’s work. They worked in this way, as a community, until they had together rebuilt their village. Perhaps the value of the cement was greater than gold dust. This incident reveals a universal truth. Given resources, and freedom to use them as they see fit, people are powerful and competent, and do not need direction from above. This brings us back to Kosovo and its paradigm of a self-organizing society. One small hope arising out of the current tragedy is that Kosovans are organizing themselves in the refugee camps, creating a new civil society there. When the time comes for Kosovo to be rebuilt, it is hoped that aid from the West starts from the premise that Kosovans, not Westerners, know best. 1 Charles H Fairbanks (1995) ‘The Withering of the State’, Uncaptive Minds, vol 8, no 2, pp5–21. 2 Lester Salamon (1994) ‘The Global Associational Revolution’, Foreign Affairs, July/August. 3 Alan Fowler (1997) Striking a Balance: A Guide to enhancing the effectiveness of non-governmental organisations in international development, Earthscan, UK. 4 Kevin F F Quigley (1997) For Democracy’s Sake: Foundations and democracy assistance in Central Europe, Woodrow Wilson Center Press, USA. 5 Charities Evaluation Services (1998) From Transition to Development: Non-profit sectors in Central and Eastern Europe, CES, UK. 6 Simon Bale (1998) Learning Together in Bristol and Timisoara, CENTRIS Occasional Paper, UK. Challenging Western models, Routledge, UK. 8 Robert Chambers (1997) Whose Reality Counts: Putting the First Last, Intermediate Technology Publications, UK. 9 Peter Kuenstler (1960) Community Organisation in Great Britain, Faber and Faber, UK.